Some commentators have looked at the measure 66 and 67 election results and argued that Multnomah County has too much power. This graphic shows the evolution of the share of all State of Oregon voters who are from either Multnomah County or the entire Tri-County region (Clackamas, Multnomah, and Washington counties) at General Elections from 1930 through 2008. The share of Multnomah County voters has been steadily dropping since the 1930s. Any suggestion that Multnomah County has too much power certainly isn’t backed up by by the voter share. The share of Tri-County voters stays pretty constant in the low to mid 40 percent range. What is happening, however, is that Multnomah County is voting much more in lockstep than it was in the 1930s, or in any earlier period for that matter. The percentage margins for measures 66 and 67 dwarfed that for 1990’s Measure 5. The partisanship is also much more pronounced than earlier. This kind of division in attitudes really does seem to be leading to a division between Portland and the Other Oregon. The comparison of measures 66 and 67 with measures 28 and 30 was the first attempt to gain some perspective on what happened Tuesday. Taking a longer term view is another attempt. The passage of measures 66 and 67, being the first tax increase passed by Oregon voters since 1930, could be a watershed event. The passage of Measure 5 in 1990 certainly was a watershed event. These two events bear some comparison. Counties voting in favor of 1990’s Measure 5 (Property Tax Limitation) are in green. Those voting against are in tan. In might appear strange to compare measures 20 years apart, and to compare what some think is the ultimate arch conservative measure in recent Oregon history, Measure 5, and what some others think are the arch liberal ones, measures 66 and 67, but the county-by-county vote pattern for Measure 5 is similar to the pattern for measures 66 and 67. 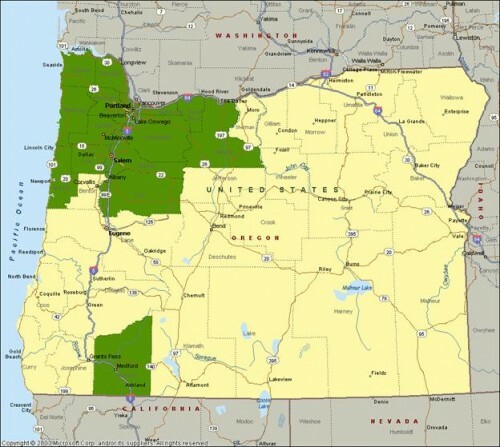 Most of the supportive counties were in northwest Oregon. First,I’ll look at the geographic similarities. One key similarity, the measures were all rejected in eastern Oregon. In all three cases the measures won in Tri-County and overcame the “no” vote from the rest of the state. One difference between the two elections was how Multnomah County compares with the rest of the state. In the case of measures 66 and 67, Multnomah’s was so strongly in favor that matched its fifth of the voters the other four-fifths from the rest of the state. However, in the case of 1990’s Measure 5, Multnomah only accounted for 45% of the Measure 5 margin. Still a big deal, but less that half the influence. Another difference is how Benton and Lane, two of the strongest yes counties for measures 66 and 67, opposed Measure 5. Though Benton has become much more liberal in the past 20 years, Lane always was pretty liberal. Together, these similarities and differences imply that there are two distinct factors driving the votes: an economic and an ideological. The ideological difference is simply that Measure 5 reduced a tax and measures 66 and 67 increased taxes. This is a Democratic vs. Republican divide, etc. The economic side of the issue helps define the difference between the Tri-County area and the other parts of the state. First, all three measures increased the relative funding for the state government over local governments leading to an increased centralization of power. The Measure 5 property tax reduction shifted relative funding away from local entities and to the state. Measures 66 and 67 increased state taxes such that local governments won’t be able to tax that money. Second, all three measures increased the overall progressivity of Oregon’s tax system measure 5 by shifting from a regressive property tax to a more progressive income tax and measures 66 and 67, by increasing the progressivity of the personal and corporate income taxes. There are other economic implications of both votes that are similar, such as regarding the overall volatility of state revenue, etc. These seem more remote from voters, however. The implications of the results of this election are just beginning to appear. There will certainly be much more on this topic in the coming months and years. Source of data: Oregon Secretary of State. The vote counts for measures 66 and 67 are based on the January 27, 2010, 4:41 AM Oregon Secretary of State Update. Measures 28, 30, 66, and 67 were the income tax measures on Oregon’s ballot during special elections during the past decade. As such, their respectively voting patterns bear comparison. This map divides Oregon’s 36 counties into thirds. Green counties shifted the most in favor from measures 28 and 30 to measures 66 and 67. Tan counties shifted the least in favor or against measures 28 and 30 to measures 66 and 67. The middle third are colored a light green. The biggest shifts were in counties in northwest Oregon. These counties were also the most favorable to measures 66 and 67. Counties in green voted for both measures. Counties in tan voted against both measures. Measures 28 and 30 were the two earlier income tax measures on the ballot in 2003 and 2004, respectively. They were put on the ballot by a Republican legislature. The pattern for measures 28 and 30 were similar to measures 66 and 67. 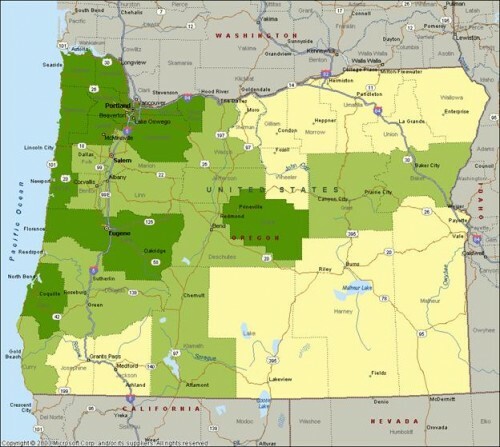 Almost all of the supportive counties were in northwest Oregon. Clearly the difference was in the margin of vote. The surveys are denoted as follows in: 912: November 30 through December 2, 2009, 1001: January 4 through 6, 2010, and 1002: January 18 through 20, 2010. An interesting characteristic is the movement of respondents with household incomes greater than $30,000. The Republicans shifted against the measure and Democrats shifted in favor of the measure during January. The segments each included about 60% or so of each party’s respondents. Identically structured surveys were conducted November 30 through December 2, 2009, January 4 through 6, 2010, and January 18 through 20, 2010. 400 live telephone interviews of likely January Oregon Special election voters were conducted . The margin of error at the sample median is 5 percent at the 95 percent confidence level for all three surveys. These surveys were conducted as part of a long-term project studying Oregon politics and not for any political committee. Lindholm Research was not working for either the Yes or No sides. The campaigns began as the first survey in the series was conducted. The series of surveys then can give a good estimation of campaign effectiveness and its timing. Measure 66 enjoyed a steady gain over time. The “no” voters largely came on board in January. Measure 67 gained significantly in December and then seems to have stalled (perhaps it was waiting for Measure 66 to catch up?). As with Measure 66, the “no” voters largely came on board in January. The January move of Measure 66 implies that the campaigns did matter and that Oregonians were significantly informed by the “yes” side. The “FINAL” results for measures 66 and 67 are based on the January 27, 2010, 4:41 AM Oregon Secretary of State Update. The votes for measures 66 and 67 was highly correlated. The same counties voted “yes” or “no” on both measures. Measure 67: 123% (Multnomah 116%). This election was practically won by Multnomah County. Multnomah County provided 95% of the margin for Measure 66 and 116% of the margin for Measure 67. Multnomah’s yes margin alone more than matched the no margin in the rest of the state on Measure 67. Lane County provided the second largest margin in support of measures 66 and 67. 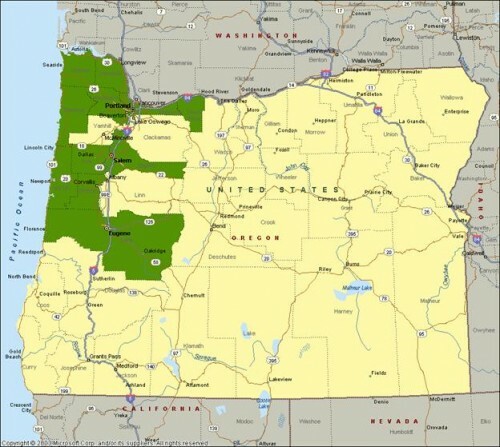 All of the counties voting for measures 66 and 67 were in northwest Oregon. Later posts will place this geographic pattern in context. The vote counts for measures 66 and 67 are based on the January 27, 2010, 4:41 AM Oregon Secretary of State Update. Minority voters had the highest approval rates. Lower income whites (up to $50,000) had the lowest approval rates. The data were analyzed using CHAID (Chi-squared Automatic Interaction Detection) methodology. The data come from two surveys, each of 400 live telephone interviews of likely 2010 Santa Clara County Primary voters were conducted first on June 16-18, 2009 and then, second, on October 26-28, 2009. Kulongoski won the primary by a wide margin. However, he barely improved on his 2002 performance.Kulongoski was the incumbent and widely supported by the party establishment. 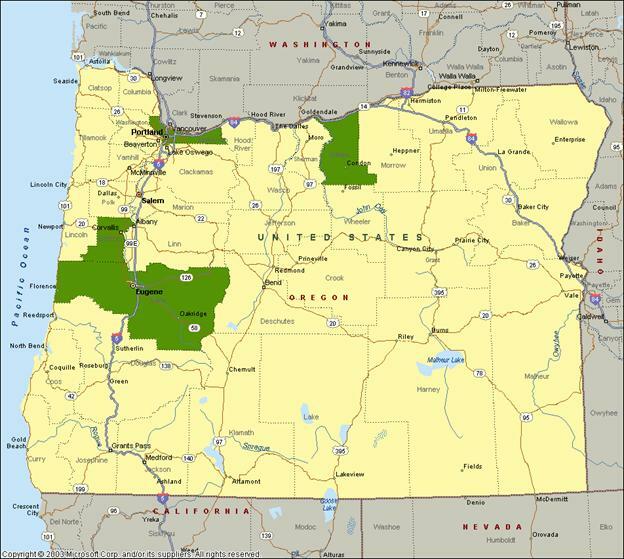 The Oregon Democratic establishment has generally gotten their nominee in recent decades. Historically, Democratic Gubernatorial primaries are much less likely to be seriously contested than Republican. 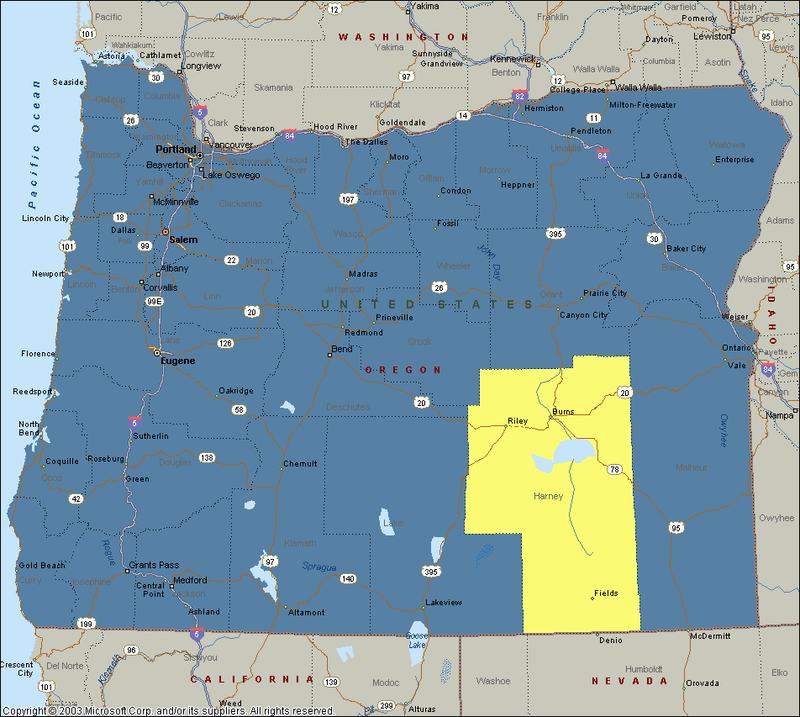 The counties Kulongoski won, 35 out of 36, are in blue.The one county Hill won is in yellow. As a sign of Kulongoski’s 2006 weakness, he lost a county in 2006 while he won every county in 2002. The critical importance for Democrats of winning the Portland media market is evident in this map. The Portland media market essentially covers all of Oregon except from Lane County (Eugene) south in western Oregon, the northeast corner of the state, and the southern tier of counties in central and eastern Oregon. The only county Kulongoski lost was far from Portland. This Week’s Polling Shows Voters Leaning Yes. Polling conducted Monday, January 18 through Wednesday, January 20 shows Measure 66 leading 50% Yes to 39% No and Measure 67 leading 51% Yes to 40% No. These results agree with other recent public polling. Both measures are still too close to call. Late deciding voters tend to vote no on broad-based tax measures. For example, the polling for January 2003’s Measure 28, a proposed temporary income tax increase, conducted by the University of Oregon’s Survey Research Laboratory, as published in the Register Guard newspaper (Jan. 20, 2003) reported Measure 28 ahead by 46% to 35% with a margin of error of plus or minus 5%. In this case, the undecided voters all went to the “no” side and the measure lost: Yes: 46% to No: 54%. 400 live telephone interviews of likely January Oregon Special election voters were conducted January 18 through 20, 2010. Identically structured earlier surveys were conducted November 30 through December 2, 2009 and January 4 through 6, 2010. The margin of error at the sample median is 5 percent at the 95 percent confidence level. This survey was conducted as part of a long-term project studying Oregon politics and not for any political committee. Lindholm Research is not working for either the Yes or No sides.